Having a lazy morning today. Couldn't fit in both the shopping trip (I am nearly out of the specialty finch food that I feed to the sparrows) and the trip to the gym and somehow settled on neither. Will wolf down breakfast, walk down to Trader Joe's for food for me, and then it'll be off to Suffolk Downs to celebrate badriyaz's birthday with a day at the races! Still digging away on photos. I have a few from September 7 (a page not yet linked from the main page--you're special here!) and have expanded the selection from September 2. September 7 is going to need some serious captioning. It was the first Baltimore game. They've instituted a new policy (at least I think it's new) at Camden that they only way you can go down to the field when the gates open is if you have season tickets. Given that no small number of Orioles season ticket holders seem to be interested in selling their tix to Sox fans, we had season tix for the Friday and Sunday games. I mention this mainly because the crowds were a lot smaller at the start of my photo-taking than they would otherwise have been. Friday I snapped a few lying-down and stretching shots (poor Jose Alexander, that wasn't even intentional on my part! 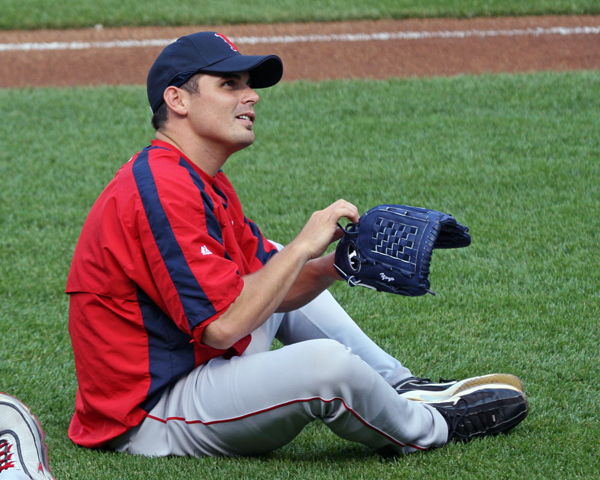 ^_^) and Kevin Cash with Yoyo's glove--and yes, it does say "Yoyo"!--and then followed the pitchers down to left field. 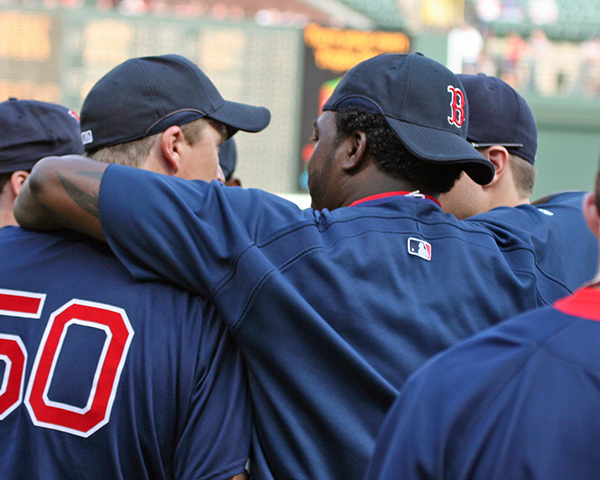 Mike Lowell and Papi went with them. Not unheard of, but a little odd. 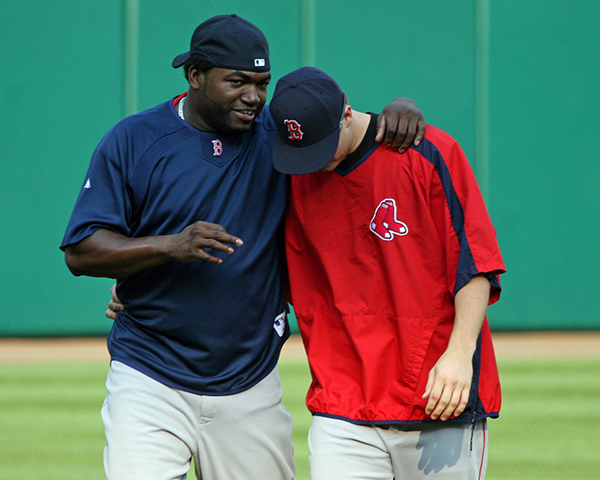 And Papi stayed with them, doing sprints, talking, smiling. 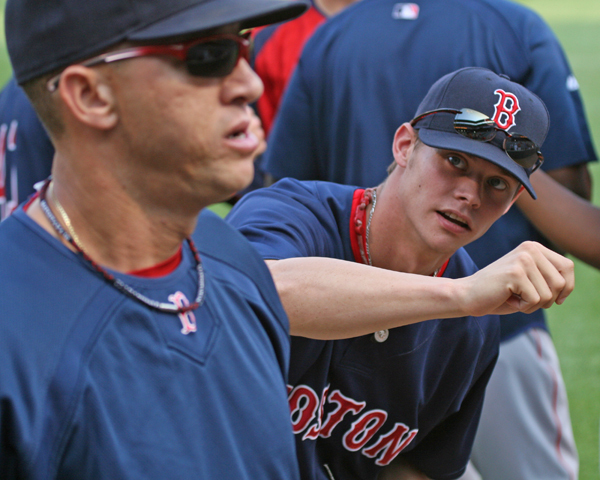 I snapped him with his arm around Papelbon, talking intently. 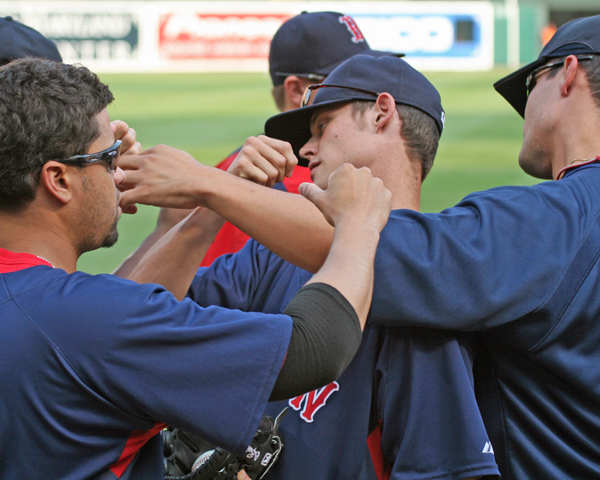 The pitchers--and Papi--gathered all together for a huddle/meeting, followed by fist bumps all 'round (I was focused on Clay Buchholz, first dodging fists and then trying so, so hard to catch Yoyo's eye for the last elusive bump!). But then I realized Papi had Timlin under one arm and Paps under the other, and this was not mere friendliness--he was clearly mediating. I don't have it on film, but after a bit Timlin reached back, took Papi's arm, and lifted it meaningfully off his own shoulders in a gesture that held no animosity for Papi but a very definitive statement that the attempt at resolution was over. I've got nothing, nothing at all, on what was going on, besides my own gut feeling, which is that Timlin was trying to tell the youngster something he didn't want to hear. And my sixth sense on that is that Paps is not 100% and wanted to gut things out, and Timlin was trying to tell him it's neither good for the team nor good for Paps himself. 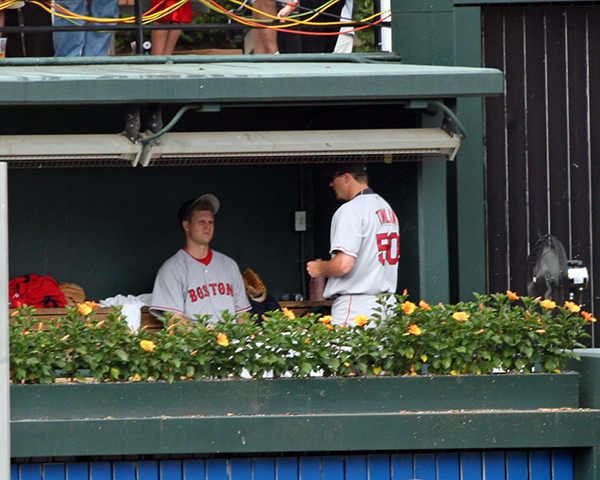 A similar discussion seemed to be going on in the bullpen Sunday. Just a very odd situation.